It’s time for another Dana Vento famous DIY, and this time it is in our laundry room, also known as our mudroom. The catchall room that really has to function hard for my family of 6. The laundry room is the epicenter of home. By and large, the laundry room is Vento basecamp for dirty laundry, stripping down to the skivvies after an outside battle that you lost to the weather and a cat’s retreat room. The Vento laundry room is the catch-all entrance and it needs to be organized and allow me to function better than it currently is. After surveying what I will term ‘the dumping grounds’, a laundry room makeover with style was born. The typical redo is not what I had in mind, rather a trip online to my favorite brand for organization and all things clutter. Ready to lavishly live life out loud on my DIY and see the laundry room makeover with a style that I just completed? Today’s post was made possible by my collaboration with Thirty-One. DIY Project, images, and content are my own based on my style. As you know DanaVento.Com only provides you with the best of the best in DIY options and today’s is insanely easy to do and the results are outstanding (IMO)! Turning our home into what I want versus what we built is the ongoing story. The laundry room is the center of so much activity from storage of cleaning goods, to the tossing of shoes, and housing to the washer and dryer. Welcome to the entrance of my chaos, where service people trot through, where groceries get unloaded, and the path that receives hockey gear, cat litter, hung laundry, rags, and other oddities. To date, the room has been painted, cabinetry has been added and a shelf, but the laundry room is a long way from functioning as it should since it is the center of ‘dump and go’, in my opinion. Storage = organization and personalization = direct orders of where to dump, place, and lay otherwise ‘tossed’ items. Here’s what I am working with in my laundry room at current. Pretty much a jumble of anything in my way. In an effort to dissuade my children from simply plunking their clothes on the floor after disrobing in this room or tossing dirty clothing from other hampers on the floor, the Stand Tall Bin is the workhorse in disguise in the laundry room. No more clothing on the floor, and that is clearly stated on the bag as I had it monogrammed ‘Deposit Only’! Odds and ends are in here as is my son’s Epi Pen, we needed a hub for this rather than just on a table. This corner in the laundry room as never functional, so between the Stand Tall Bin and the Hang-It-Pocket Organizer (Charcoal Crosshatch) it’s a center for catching the daily flow of stuff! The cabinets are filled with things I would love to use if I knew they were there. Time to organize and I used the Thirty-One Mini Storage Bins to do so. The ‘V’ of course for our last name! In the other cabinet, you can see, The Your Way Rectangle (above cleaning products) with the lid off and placed underneath. How many ways do I love the Essential Storage Tote that offers endless storage usage especially as a ‘hiding spot’ for when the unexpected drop in? In case you do not know what piece I am talking about it is on TOP of the washer. Undoubtedly you noted the HOME on it, but did you really look? It has my STATE on it Pennsylvania and it is in Black and Gold (Pittsburgh Sports Teams). Our Home is the ICON-ITS design. Another Quick Cinch Thermal is in the laundry room and if you look under my laundry tub, you will see my laundry detergent and it’s no longer scattered. In particular, it will never be out again, and it will continue to look neat and tidy. As I mentioned before the versatility of this bag is cool as I folded down what could be cinched and if company comes, I will cinch it shut! I am all for keeping the laundry room, light and airy and I did this with the colors that I chose. I kept them neutral yet fun. Chevron Squares mixed nicely with Charcoal Crosshatch and Woodblock Whimsy just complimented them. The Monogramming in Citron ‘V’ ‘Rag Bag’ truly POPS the colors in the room paint and pulls it all together. Trust me, I did this DIY in a few hours, after I weeded through all kinds of junk that were in there, and donated all the stuff we no longer used. It was time for a fresh start and organization is key. You too can find all the lavish pieces to create your own laundry room makeover with style at Thirty-One, find your local rep and shop till you drop. Ordering is all day every day, so get online and get organized. Oh I just love how organized everything is and neatly labelled. I definitely would love to adopt something like this but for my kitchen. I love that makeover. 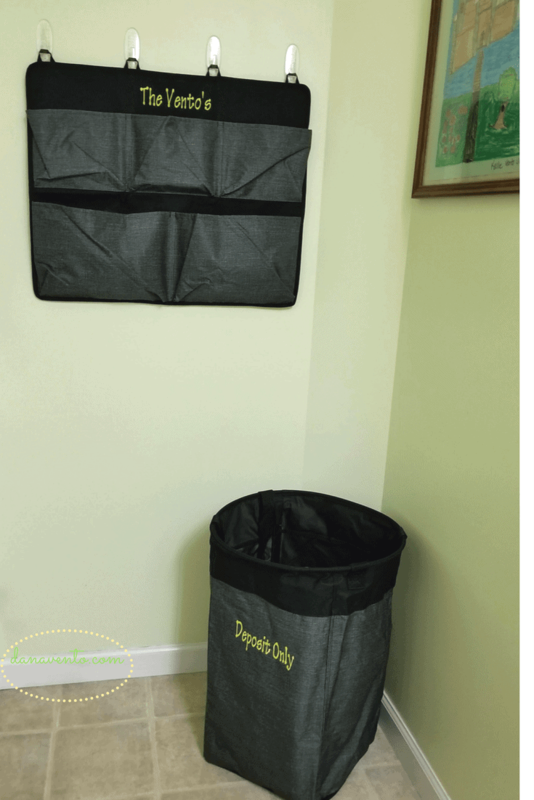 I don’t have that much space for my laundry room but I want to also use a Hang-It-Pocket Organizer like the one you have here. Thanks for the idea! such good ideas, i love those baskets – they are useful and look so cute. i need to rethink my laundry room too… maybe add a couple baskets in there too. Those are pretty cool storage bins that you have there. I know they have so many different ways to organize well that are out there. I really love some of those great container stores. I love the change! It’s awesome how some cute accessories can make such a difference! Your laundry room looks wonderful! Getting things done is so much easier when you can find what you’re lookin for! Great job. I love what you’ve done with that laundry room! Mine needs a make-over. You’re my inspiration! I love the before and after! The bins make such a huge difference, it looks so elegant! I’m diggin the design on those mini storage bins. Just makes me want to get really really really organized. I love your laundry room makeover! It maximize the space and it looks very neat. The personalized bins look so cute. Wow. With laundry like that, I can stay and have a me-time during laundry. Great tips and make-over. Everyone likes clutter free atmosphere, and laundry room indeed remains pretty cumbersome. The solutions given here could be a great way to keep the laundry clean. The big tote bags are ideal as multipurpose storage. I think you did a great job for using these storage bins to organize stuff! I also love the Hang It Pocket Organizer, I might as well get one for myself soon! What a great product. So creative and innovative, I am really impressed. Looking to buy this as soon as possible. Your laundry room does indeed look neater now! My only problem with the top rack is: wouldn’t it be harder to get stuff out considering that everything has been placed in a storage? Thanks for sharing your kitchen makeover idea. I think it’s also time for me to change and declutter my laundry room too. So amazing how the right size of accessories and keen eye can do to uplift a cluttered laundry room. I struggle with the same issues too and so good to read this to get more inspiration. I try to fix up little by little everyday so things are more organized and choose the right accessories for it. The way you organized your laundry room totally rocks! It’s definitely better to work when you can find things you need easier. Great job! Being able to find everything quickly is a must and a laundry room takes the hardest beating so it is important to be organized. I enjoyed this DIY tips you shared. I tried to see my Laundry room and I think it really needs a make-over too. very cool looking laundry room. I would definitely visit. This is very helpful! My wife has always had a hard time organizing the laundry room. It is always messy. The items used look promising. I will be letting her read this, for sure sure she will be excited. Thanks so much!